The UCLG-ASPAC Congress gathered over 1,000 delegates from 43 countries – working with local governments, international development organizations and the academe to exchange knowledge on innovative solutions towards the implementation of the Sustainable Development Goals (SDGs) and the New Urban Agenda in cities. CDIA Program Management Officer Mia Simpao led the training session with Natalja Wehmer from UNESCAP, delivering the presentation on the 2030 Agenda, the role of local and regional governments, as well as the challenges and opportunities in localizing the SDGs. UCLG Learning Director Sara Hoeflich also provided key inputs on aligning and monitoring local activities with the SDGs by providing the case of Chefchaouen City in Morocco. 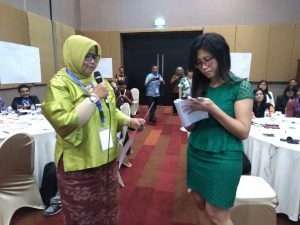 The interactive training session was attended by around 50 participants coming from local governments, national agencies, and other development organizations in Asia, who also participated in the exercises and group works to assess the level of achievement, challenges, and opportunities of their respective cities in implementing the SDGs. 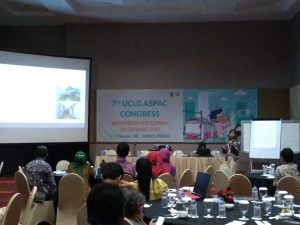 As with the previous trainings held by CDIA on localizing the SDGs, this training session at the the UCLG-ASPAC Congress 2018 was well received by participants who appreciated the interactive and participatory learning methods and materials. 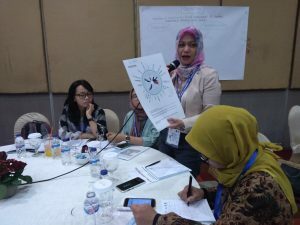 The modules for this training were developed by CDIA, GIZ, UNESCAP, UCLG, CityNet, ICLEI Local Governments for Sustainability, UN-Habitat, and the UNDP.